Life is composed of diff erent stages; there’s cradle to teen to adult, middle age to senior, and senior to what? Mandy is that senior; one who can live for the day and let the “what” take care of itself. When her daughter Bonnie insists on her moving to an assisted living facility, Mandy is livid. She soon finds out the amenities far outweigh living on her own. St. Mark’s off ers a posh suite of rooms, meals in a four-star dining room, one’s own aide, and best of all–people! For Thelma, a doll beloved by Mandy, St. Mark’s is a paradise. A whole new world opens to her at the stroke of midnight when she and all the other solace toys meet in the library of St. Mark’s. Secrets abound among the residents of St. Mark’s, and most of these are revealed when all the toys gather in the library and discuss the day’s events. Billie Thomas resides on Long Island and has been an accomplished artist for many years. Her avid love of mysteries inspires her literary style and lends a touch of her life experiences to each novel that readers can relate to. Billie is one of four children who grew up in Linden, NJ. Her father heavily influenced her life, having to support the family with a variety of jobs. She remembers fondly her Christmas holidays, when her father would buy a Christmas tree that was too large for the house. He would always have to cut the top off the tree. He would place his Christmas village around the oversized tree and run old trains he had rewired after finding them in other people’s attics while cleaning them. To this day, she was amazed the house did not burn down. 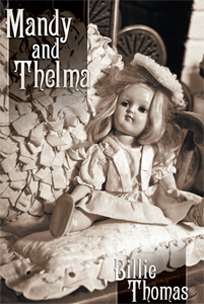 Join Billie on Twitter and Facebook to discover more behind the story of Mandy and Thelma.